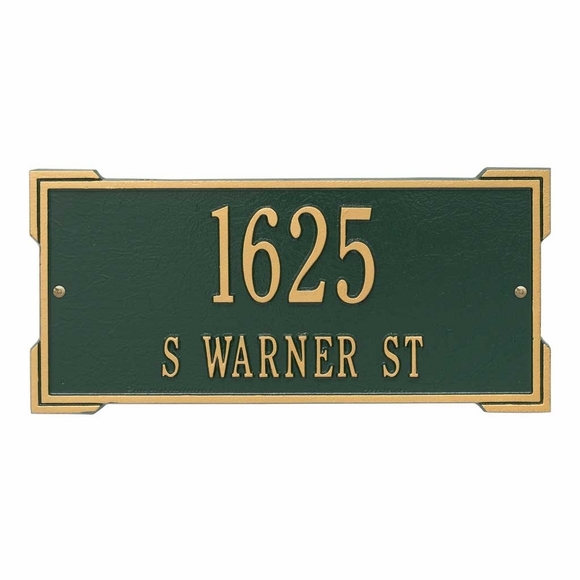 Roanoke Double Corner Rectangle Address Sign - - one line or two line 16.63" x 7.88" rectangle sign with a unique double border at each corner. Made in USA. The one-line version holds up to five 3" numbers or up to seventeen 1.25" characters (including spaces). The two-line version holds up to five 3" characters on line 1 and up to seventeen 1.25" characters (including spaces) on line 2. Colors (from left to right in small images): BG black with gold characters; BS black with silver characters; BW black with white characters; GG green with gold characters; OG bronze with gold characters; PS pewter with silver characters; and WH white with black characters (not shown). Also available in a larger estate size (see Related Products).